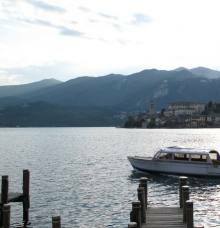 Isola di San Giulio (San Giulio Island, the only island on Lake Orta) is approximately 400 metres off the shores of Orta and like the town, gets its name from a preacher saint who arrived here in the 4th century together with his brother San Giuliano. It’s connected to the dry land with a scheduled summer boat service from Orta San Giulio, a service which also travels to Omegna and Pettenasco. Approximately 275 metres long and 140 metres wide, the island extends from north to south, where the point is dominated by the Basilica of San Giulio and the adjacent Palazzo del Vescovo. 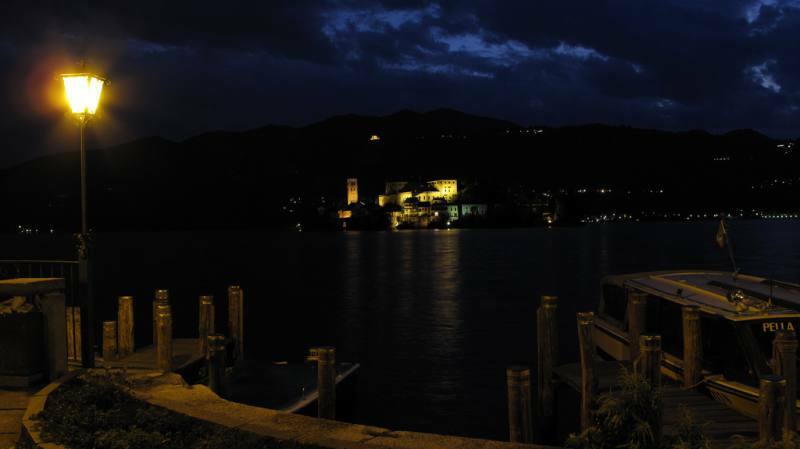 Legend has it that it was precisely San Giulio who overcame the dragons and serpents infesting the island (perhaps the symbol of a pre-existing pagan settlement), and he chose it as the place for his church. The buildings were once all lived in by canons. In addition to the basilica, the island is home to Palazzo del Vescovo di Novara (the palace of the bishop of Novara), the former seminary and a 19th-century building currently lived in by nuns in the Benedictine order. The Monastery of Mater Ecclesiae was established in 1973. The island was also a defence rampart over the centuries, for the entire Cusio area, first as a possession of the Longobardic dukedom (Duke Mimulfo was killed here in 590 on orders by King Agilulfo) and then of the counts-bishops of Novara, thus becoming the religious fulcrum of the Riviera. Scheduled boats (private boat services are also available) land on the southern tip, on a meadow with horse chestnut trees. Just beyond this to the left is access to the Basilica of San Giulio - a treasure of Romanesque architecture from Novara. Continuing along the only road around the island is a series of buildings and dwellings, once completely occupied by canons and today owned by private individuals or bodies. Courtyards and green gardens are just beyond the buildings. In addition to its historic-artistic treasures, restaurants and shops are also open to visitors during the tourist season. The island comes alive in the summer with events and the old dwellings become charming stages for performances or concerts, such as the Festival Cusiano di Musica Antica (local ancient music festival) which is held in marvellous 18th-century Villa Tallone.